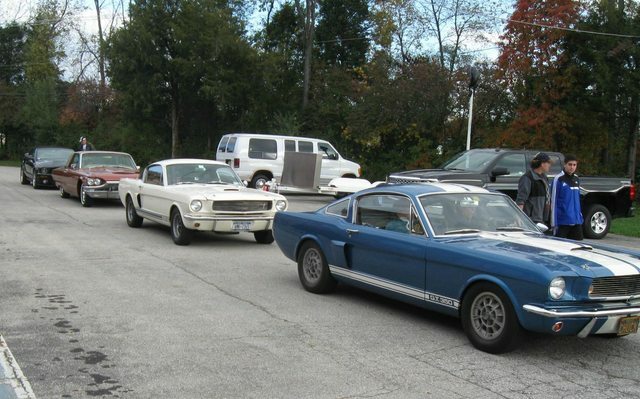 Runnin' with the "Big Dogs"
We took our '65 and made the trip to Gettysburg [PA] a couple of weekends ago for the Shelby Club's "Northeast Regional" Event and Tour. We had a great day. The tours have been a highlight of these gatherings - a nice change of pace from standing in a parking lot looking at cars as we do at most shows. 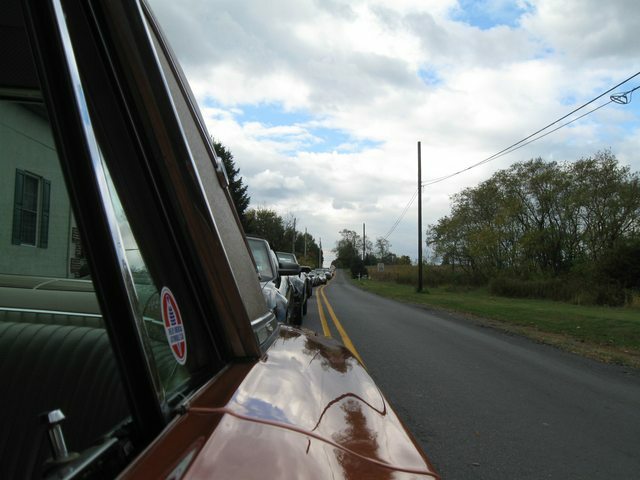 Set in rural areas of central PA and featuring uncrowded backroads, fall foliage, and Ford V8s, we've enjoyed some great rides. We've attended this meet for the last 4 years with our Tiger, and decided to change it up this year. 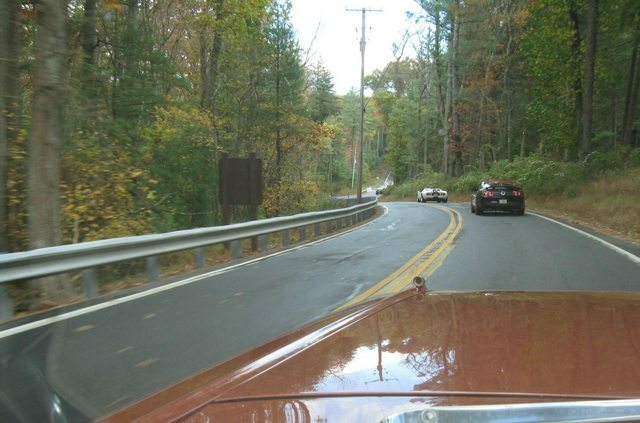 I had some concerns about the rapid pace on twisty back roads that we had experienced in prior years, but this year the driving seemed slightly more subdued... or at least there weren't as many sharp curves(?). In any case, we were able to stay with the pack of "Big Dogs" without any trouble. I was pleased to get quite a few nice comments about our 'Bird from other attendees as well as regular folks at the hotel. I was taking the cover off of the car one of the mornings at the hotel, and an M-B suv that had been passing thru that area of the parking stops - as if they are watching me. Now, remember I'm working with an old Thunderbird in the midst of a bunch of very nice/high end Shelby [and other special] Mustangs. As I finish removing the cover, the lady rolls her passenger window down and says. "you know, you're unwrapping my husband's Kryptonite". Apparently he had a Flairbird at one time and still misses it. Like the Mastercard ad says... "Priceless"
Re: Runnin' with the "Big Dogs"
The emberglo looks great Mike...Last time I stopped by your house with my '66 ragtop a couple years ago, I got to see it and the Sunbeam among others. IIRC you were going to get some mechanical work done on the Emberglo by Pat Wilson(?). Looks like everything worked out good! '66 Ragtop, 77k miles. Antique bronze. Brought from original owner. Fully documented. Thats great!! Now to make people cringe a bit. Im was just watching a show about resto corvettes, basically an old vette body on a new chassis. I was thinking how funny that could be to have a newer high performance mustang chassis under a bird with about 500 hp and the handling package. That would bring some raised eyebrows!! BrianC wrote: The emberglo looks great Mark...Last time I stopped by your house with my '66 ragtop a couple years ago, I got to see it and the Sunbeam among others. IIRC you were going to get some mechanical work done on the Emberglo by Pat Wilson(?). Looks like everything worked out good! Did you decide to keep your 'vert then? franklin wrote: Thats great!! Now to make people cringe a bit. Im was just watching a show about resto corvettes, basically an old vette body on a new chassis. I was thinking how funny that could be to have a newer high performance mustang chassis under a bird with about 500 hp and the handling package. That would bring some raised eyebrows! !